Friends and officemate will certainly greet Meat Lasagna a la Santa with approving oohs and aahs because the flavor meter will surely go nuts with this. And its quite filling too! Chef Boy's tip for this dish: sautee the meat very well to bring out fine-smelling aroma. And go easy on the bechamel sauce - thick doesn't quite make it. 1. Cook lasagna noodles in large pan of salted water a few pieces at a time. 2. Drain when tender but still firm, and spread them out to dry on damp cloth. 3. Heat bolognese sauce and béchamel sauce. 4. Grease baking dish ceramic oven-proof with butter and line bottom with béchamel sauce and Bolognese sauce, a thin layer of lasagna, a few grated quickmelt cheese, mozzarella cheese and a generous sprinkling of parmesan cheese. 5. Continue until all ingredients are used up, reserving a few tablespoons of sauce, the last layer being of plain lasagna. 6. Spread remaining sauce and dot with slivers of butter. 7. Bake in moderate oven (375°F) for 30 minutes. 8. 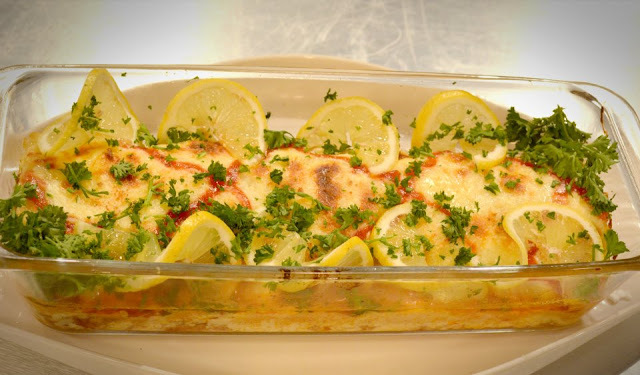 Serve lasagna very hot in the same dish and garnish with parsley.